Cooked and smoked pork hot dogs with cheese. Keep refrigerated. 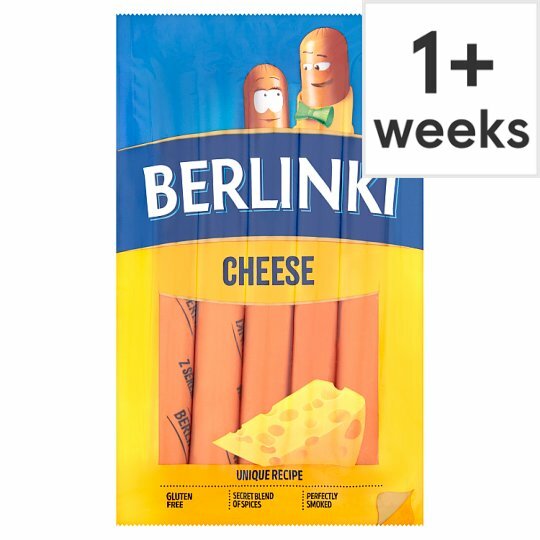 Use within 2 days of opening. Do not exceed Use By Date. Boil (From Chilled): Place hot dogs in a saucepan of boiling water. Bring back to the boil, then reduce the heat and simmer for 3 minutes. Drain and serve. Cooking Instructions (General): Remove all packaging including the plastic casing on each individual hot dog before eating or re-heating. Ensure the hot dogs are piping hot throughout before serving. Microwave (From Chilled): Place hot dogs on non-metallic plate, cover with cling film and microwave on full power for: 30 seconds at 650W or 20 seconds at 800W for 2 hot dogs; 1 minute at 650W or 50 seconds at 800W for 4 hot dogs. Leave to stand for 1 minute before serving.